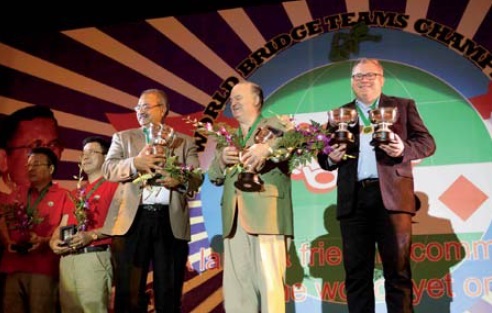 The world bridge teams champ. 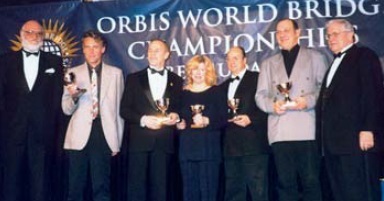 The first World Transnational Open Teams Championship was held in 1997. It is staged during the second week of the Bermuda Bowl, Venice Cup and is open to teams containing players from more than one NBO. 1. ZIMMERMANN: Thomas Bessis, Geir Helgemo, Tor Helness, Krzysztof Martens, Franck Multon, Pierre Zimmermann (PC). 2. BULGARIA OPEN: Diyan Danailov, Rossen Gunev, Valdimir Mihov, Ivan Nanev, Jerry Stamatov, Julian Stefanov, Valdislav Nikolov Isporski (NPC). 3. YBM: Ehud Friedlander, Inon Liran, Juei- Yu Shih, Ping Wang, Chen Yeh, Yalan Zhang, Chi Hua Chen (NPC), Shu-Ping Yeh Tong (Coach). The Transnational teams proved extremely popular with 137 teams competing in one of the biggest events of its kind. Zimmerman’s victory never looked in doubt, as he came 2nd in the Round Robin, then led in all the KO matches. 1. GORDON: David Berkowitz, Jacek Pszczola, Pratap Rajadhyaksh, Michael Seamon, Alan Sontag, Mark Gordon (PC), Susie Miller (Coach). 2. SAIC VW: Dai Jianming, Shao Zi Jian, Yang Lixin, Zhuang Zejun, Hu Mao Yuan, Liu Yi Qian, Zhang, Jiangliang (NPC), Cai Longgen (Coach). 3. WHITE HOUSE: Jan Jansma, Richard Ritmeijer, Magdalena Ticha, Gert-Jan Paulissen (PC). 105 Teams competed in the event. Both the matches for Gold and Bronze were very thrilling. At the end of two nailbiting matches, Gordon defeated SAICVW 92-81 and White House defeated PDTIMES 55-51. 1. ISRAEL JUNIORS: Alon Birman, Lotan Fisher, Gal Gerstner, Moshe Meyuchas, Dror Padon, Ron Schwartz (PC). 2. OZ OPEN: Nabil Edgtton, John Paul Gosney, Hugh Grosvenor, Sartaj Hans, Tony Nunn, George Bilski (PC). 3. PARIMATCH, RUSSIA: Yury Khiuppenen, Jouri Khokhlov, Vadim Kholomeev, Mikhail Krasnosselski, Georgi Matushko, Andrey Gromov (PC). 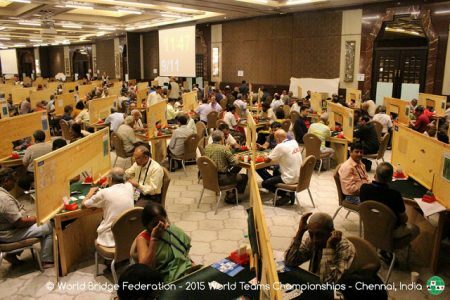 A tremendous new record of 151 Teams competed in the 8th World Transnational Open Teams. 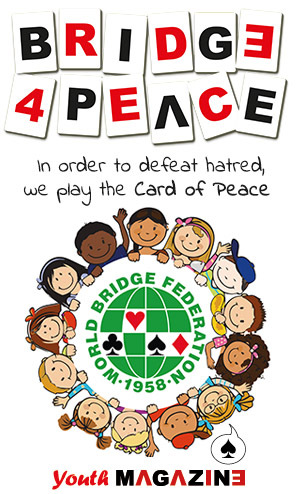 This Championship, in which strong players from all over the world took part, including among them some of the top ranked WBF players and all the medallists from the previous event in São Paulo, will be remembered for the extraordinary victory of the Israeli Junior Team, holders of the World, European and FISU Junior titles. After a thrilling semifinal won by 7 IMP against the strong USA team of Gordon, the Israeli team defeated the Australian team Oz Open which included the 20 year-old Australian star Nabil Edgtton. 1. 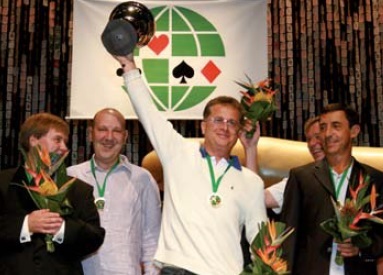 ZIMMERMANN: Cezary Balicki (Poland), Geir Helgemo (Norway), Tor Helness (Norway), Franck Multon (France), Pierre Zimmermann (France), Adam Zmudzinski (Poland). 2. APREO LOGISTIC POLAND: Krzysztof Buras, Piotr Gawrys, Jacek Kalita, Krzysztof Kotorowicz, Grzegorz Narkiewicz, Jacek Pszczola. 3. DEUTSCHLAND: Michael Gromoeller, Andreas Kirmse, Josef Piekarek, Alexander Smirnov. 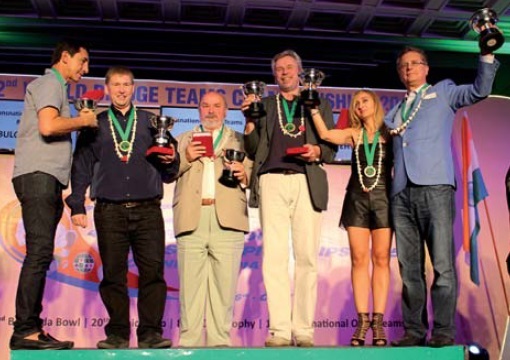 68 teams entered the 7th Generali World Transnational Open Teams, which started after the conclusion of the Quarter-finals of the Bermuda Bowl, Venice Cup and d’Orsi Seniors Bowl. In addition to several strong national teams that did not reach the Semi-finals of the main events the field included a selection of new arrivals, including front-line professional teams from America (Welland), Poland (Apreo Logistic), France/Norway/Poland (Zimmermann) and USA/Norway (Mark Gordon). Although Zimmermann was favourite, due in no small measure to a five-and-a-half-IMP carryover cushion, both teams were in good form and featured three strong partnerships. Apreo Logistic Poland took a small lead after winning the first set by 7 IMPs, but lost those IMPs back in Set 2. Apreo Logistic Poland won the final segment by 3 IMPs but the number of tricks taken on the final deal was at issue and it took some time before the official result could be confirmed: Zimmermann by 2.50 IMPs. 1. ZIMMERMANN: Michel Bessis, Thomas Bessis, Fulvio Fantoni, Claudio Nunes, Franck Multon, Pierre Zimmerman (France/Italy). 2. RUSSIA: Cezary Balicki, Alexander Dubinin, Andrei Gromov, Victoria Gromova, Tatiana Ponomareva, Adam Zmudzinski (Poland/Russia). 3. GERMANY OPEN: Tomasz Gotard, Jacek Lesniczak, Josef Piekarek, Alexander Smirnov. Yet another record was achieved in Shanghai with 149 teams competing in the 2007 Championship. The Zimmermann team overcame a 4-IMP deficit on the final deal of their match with Team Russia to win the WTOT 103-99. 1. SCHNEIDER: Peter Schneider, Grant Baze (USA), Piotr Gawrys, Marcin Lesniewski (Poland). 2. SPECTOR (USA): Warren Spector, Bart Bramley, Bjorn Fallenius, Roy Welland, Mark Feldman, Chip Martel. 3. 777 RUSSIA: Sasha Dubinin, Andrei Gromov, Jouri Khokhlov, Maxim Khven. A record 134 teams with players from every WBF Zone ensured the success of the event in Estoril. 1. 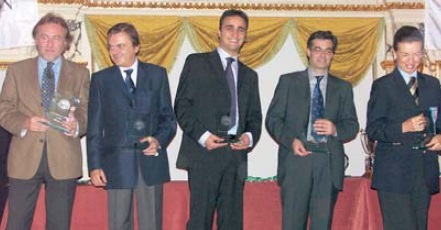 Leandro Burgay, Andrea Buratti, Carlo Mariani, Guido Ferraro, Massimo Lanzarotti, Mario D’Avossa. 2. Haojun Shi, Jie Zhao, Zejun Zhuang, Zhong Fu, Weimin Wang. 3. 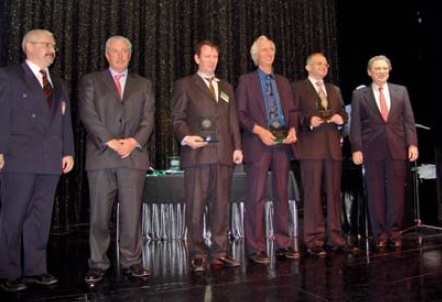 Jan Jansma, Bauke Muller, Louk Verhees Jr, Simon De Wijs, Antoine Van Hoof (NPC). The entry was again 74 teams. In the final, team Lavazza defeated Zhuang of China with the bronze going to team Jansma from the Netherlands. 1. Eddie Wold, Mike Passell, Michael Seamon, Geoff Hampson, Diego Brenner, Gabriel Chagas. 2. Cyril Bureau (Captain), Danièle Gaviard, Patrick Sussel, Philppe Selz, Vanessa Reess. 3. 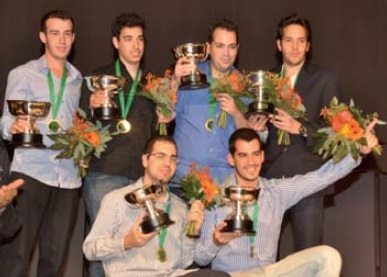 Yoram Aviram, Michael Barel, Nir Grinberg, Ilan Herbst, Ophir Herbst, Doron Yadlin, Israel Yadlin. 74 teams entered the third edition of this popular event. 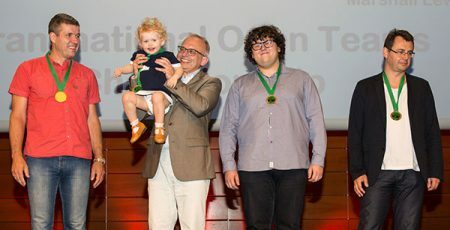 The winner was Malcolm Brachman’s team representing USA and Brazil, the silver medallists were from France with a team from Israel taking the bronze. 1. MELTZER: Rose Meltzer, Peter Weichsel, Alan Sontag, Cezary Balicki, Adam Zmudzinski. 2. Fred Gitelman, Marc Jacobus, Robert Levin, Reese Milner, Brad. 3. Kalin Karaivanov, Vladimir Mihov, Ivan Nanev, July Popov, Jerry Stamatov, Roumen Trendafilov. 76 teams participated in the second World Transnational Open Teams. The winners were a team from USA and Poland, second was the team Milner from USA and Canada and the third placed team were from Bulgaria. 1. 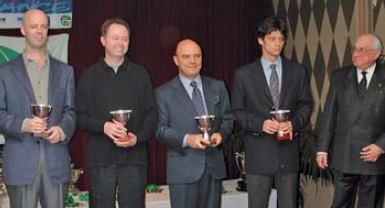 BURGAY: Leandro Burgay, Dano de Falco, Krzysztof Martens, Marcin Lesniewski, Carlo Mariani. 2. JASSEM: Krzysztof Jassem, Ireneusz Kowalczyk, Piotr Tuszynski, Marke Witek. 3. GARDYNIK: Grzegorz Gardynik, Michal Kwiecien, Tomasz Przybora, Jacek Pszczola. The first edition attracted an impressive field of 74 teams. The winners were an Italy/Poland team with Polish teams taking both the silver and bronze medals.